You can't zoom in any further. The closest zoom is the source art level. Any closer and you'll pixelate the background. Edited by Cluas, 21 August 2014 - 04:23 AM. - Make the UI distinguish clearly between 'At will', 'Per Encounter', 'Per Rest', 'Modal' abilities by grouping them into rectangled frames. - Make Resolve combine the interrupt/resistance against interrupt stat and give perception a bonus to the range of ranged weapons, range of targeted abilities and radius of engagement, making it beneficial to all classes. Idea/Brainstorm/Suggestion for Necromantic Chanters and/or Forbidden Magic. Save games need to be ordered in some way that isn't alphabetical. Most recent at the top would seem the obvious way. Please change stat system to more classic and easy-to-understand type. Quest items need to go into the quest item loot area regardless of whether the main character or a companion picks them up. This is just a quality of life issue... until you change companions and remove someone who had a quest item you didn't notice and then it becomes horrible. As suggested in another thread I'd like an autopause at the end of any action (spells, class abilities, moving) to be implemented. Also an autopause when a party member is idle. That way we can chain actions without any delay - essential in heavy combat scenarios IMO (at least for those who play with the autopause). 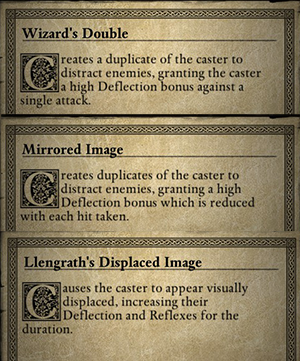 And it helps alleviating the problem of tracking cast duration of various abilities and spells. Edited by Tanred, 21 August 2014 - 08:13 AM. As an additional comment on this, I just picked up the currier's key with an NPC. This made me unable to open his door until I dragged it to my main character's inventory. 100% unejoyable experience. Pick up quest items into quest item area please. MONK ANIMATIONS. I'm not sure if they have been limited just for the backer beta, however assuming this is not the case, I really think they need more work. Firstly, the current monk attack is only a slight adaption of the non-monk unarmed attack animation. This isn't really good enough considering how long the game will have us staring unblinkingly at our little avatars of death and joy. A small combo or kick added in just to spice it up a smidge would be a real improvement in terms of convincing the player that this is a monk dedicated to the fighting arts and not just some daft brawler. Equally important (maybe more) is the lack of an "en garde/weapon drawn" fighting stance once in combat. Having the monk avatar go from standing up at attention into the scripted punch animation every-time looks a little ridiculous and really doesn't fit with all the other classes standing at the ready with their weapons drawn and ready for combat. Although this might seem to be a minor issue it really does detract from my own personal enjoyment of combat as it is a constant visible niggle concerning my favorite class. I hope I'm not alone in my views as it would be wonderful to see this improved. THAT SAID I am loving everything else about the game, bugs aside, and will continue to play regardless. Upbringing different, and thus, different attribute bonuses/developments/training. This could make combat more interesting, in a way, as well. When you fight against an Aumaua vs an Orlan, they'll have different Attribute strengths. Total: 25 (78 total in PoE) points left to spend on Character Creation. EDIT: Making Attributes more thematic, I believe, adds massive roleplay value. Edited by Osvir, 21 August 2014 - 11:02 AM. I think the terrain to improve more is the combat system, aside of the huge amount of bugs there, I think what is happening is not clear, thus it drives to a bad experience. First, make circles around persons/monsters more visible and more distinguishible. Improve the information we see, at the moment you just see numbers around, but you don't know who's doing what. Movement has to be improved. Normal mode speed should be slower or slow mode should be faster. Make terrain elevations more clearer. - When reading the character's stat page, you can't switch characters, you have to close it, select a different character and then open it again. - Combat lacks weight and feedback, like characters shouting and the screen shake when you land a critical. It's also very hard to see when and if characters are actually performing the actions you ordered them to do, be it casting a spell or attacking an enemy. It's a pain to find relevant info instead of "Bob recovered 0 stamina because stuff", and you can't scroll back much. It's so short that you usually can't even go as back as the start of a battle you just fought. The log history should be longer, and allow you to filter out these pointless stamina recoveries. - There's a lot of repetitive and boring spells. Seriously, most of the spells are "decrease/increase X stats", followed then by some damage spells that also "decrease X stats". There are almost no utility spells like Dispel, Identify, Knock, Sense Trap, Charm, Sleep, Detect Invisibility, etc... Instead you have ultra-specific stuff like "decrease by X% the accuracy of disengagement attacks in the area". - Documentation is seriously lacking. I.e., the game shows that the Resilience stat raise Concentration. But nowhere it explains what Concentration is. The lines are obviously weird, but the worst offender are these % everywhere, that you can only guess. "+50% Crush damage" means that it boost my Crush damage in 50%, or it adds 50% of my damage as additional Crush damage? I have no clue. 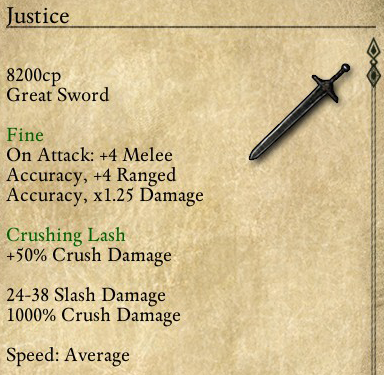 And what the hell is 1000% Crush damage, since the weapon gives Slashing damage? - Most importantly, items feel to similar. There might be more interesting items in the full game, but the Beta lacks any game changer. Everything is "gives you a bit more of X". 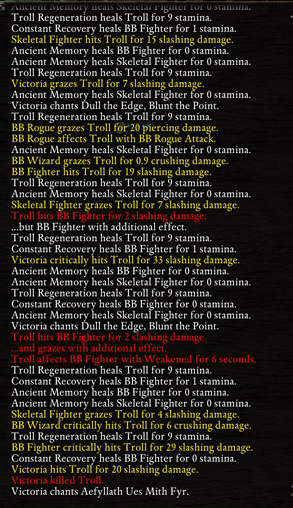 Looking at the item enchantment list, I feel like looking at Diablo's random item generator. if you're creating unique weapons with lore and all that, make them really unique, not just a weapon with two enchantments that you can do yourself. Think Lilarcor, Adjatha the Drinker or Crom Faeyr, not Diablo-ish loot. - The space to sell stuff in stores is too small. It makes impossible to trade a lot of junk for something powerful. - Might is too powerful and Intelligence too weak. That's especially true if you plan to create a custom party. Just create a Priest with a lot of Int as "main character" and you'll have both buffs and dialogs covered. Every other character you create can just stay at Int 3 without losing much. Then I think it proves your point about how having no consistency is confusing. Excellent points Felipepepe, agree with pretty much all of that. It has probably been mentioned, but Tab should highlight loot piles. Just fought some Elder Lions and they were behind a tree when they fell...had to pixel hunt a bit to find their dropped fangs. I haven't seen anyone take issue with it, and to be honest it does look great so this is low priority, but it would be nice to be able to do a vertical/horizontal switch on the two UI elements besides the log and move them about the border of the screen. I believe that in Wasteland 2 something like this is possible, and I'm not sure how the UI resources are handled in PoE, but if it's relatively easy to allow these elements to be flipped vertically and relocated, I'd certainly like to try out some different arrangements. It might be nice to be able to move the characters vertically to the top-right, etc. Just a thought. Everybody's favorite Role playing party? Do the new subclasses have unique dialogue options?